DMAE is short for dimethylaminoethanol, a naturally-occurring nutrient that enhances acetylcholine (ACh) synthesis. Adequate levels of ACh are important for proper memory function. Normally found in small amounts in our brains, DMAE has been shown to remarkably enhance brain function when used as a supplement in clinical studies. By any definition, DMAE is the perfect companion to carnosine in a natural anti-aging formulation. First, it reinforces carnosine's own anti-aging properties. Then, it provides a whole series of complementary benefits of its own. One of the prime actions of DMAE is that it flushes accumulated lipofuscin from your body – from the neurons in your brain, from your skin, and from all other organs. Lipofuscin is the pigment commonly found in aging brains and in other tissue such as the skin (think liver spots). By itself, it is not dangerous. It is merely a byproduct of harmful reactions that have already taken place. However, if enough of it accumulates over time, it can interfere with proper cellular and organ functions. DMAE also complements carnosine in that DMAE on its own has been shown to inhibit and reverse the Cross-Linking of proteins and extend lifespan. Many people have heard of the anti-aging results that Romanian scientist, Ana Aslan, achieved using something called GH3, or procaine. What most people do not know is that GH3 breaks down in the body to form DMAE (after first metabolizing into DEAE) and PABA. 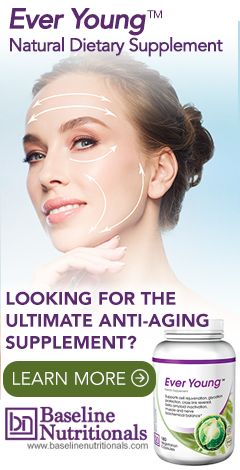 In other words, DMAE is the key active component in Ana Aslan's anti-aging formula. It should be no surprise, then, that DMAE is also included in Jon Barron’s own natural anti-aging supplement, Ever Young. Clinical studies have shown that DMAE dosages of up to 1,600 mg per day have been used with no reports of side effects. In some cases, some people may experience slight headaches, muscle tension, or insomnia if they take too much too soon. These effects are easily eliminated if intake is reduced and then gradually increased. Although there is no direct connection, many manufacturers recommend that women who are pregnant or breast-feeding, anyone who suffers from convulsions, epilepsy, or seizure disorders, and people with manic-depressive illness should avoid using it due to DMAE side effects. This is probably more of a legal issue than a medical issue.